I love how the white flowers look just like fluffy whipped cream icing. These flower cakes would make beautiful centerpieces and conversation starters at any wedding reception! Happy National Dessert Day Everyone! I have been celebrating all day! I discovered S'more Smoochies earlier today and I've been so anxious to get home tonight and tell you about them! I was going to wait to post these until I had a chance to order them and give you my 'professional sweet tooth opinion', but I couldn't wait :) My review will have to come in a later post! So a S'more Smoochie is basically a good old fashioned s'more taken to a whole new stratosphere! In addition to the traditional graham crackers, chocolate and marshmallow, you can choose from a variety of topping like sprinkles, nuts, chocolate chips and coconut. You can also order them or without peanut butter. I'll take mine with peanut butter please!! They also make adorable little S'more Smidgens which are bite sized versions. The customization options are endless - they can print a photo, logo or other image onto milk or white chocolate coins that are placed on top of the s’more. Fake Cakes - What a Brilliant Idea! Besides being beautiful, this cake is also FAKE! Ultimate Fake Cakes, based in Michigan, creates beautifully decorated wedding and specialty cakes with styrofoam tiers hidden inside. These cakes are much less expensive than 'real' tiered wedding cakes. According to the Fake Cake website, foam cakes can often cut a cake budget in half. If a cake cutting ceremony at the reception is desired, brides have 3 options: 1) Have their chosen baker create an edible top tier, 2) a slice can be placed in one of the tiers where a cake knife can be inserted creating the “look of cutting the cake” and 3) a cake compartment can be placed on the bottom tier in the back where a slice of real cake can be placed. Guests are typically served slices of sheet cake, cupcakes or other pastries. Fake Cakes can be shipped nationwide and can be shipped back to the vendor after the wedding is over. They have really thought of everything! Skinny Cow Ice Cream Sandwiches - Who would have guessed?! How cute is this platter of strawberry shortcake Skinny Cow Ice Cream sandwiches?? I think these would make great a low-fat alternative to cake at a bridal shower or even for a fun ice cream buffet at a wedding reception. Skinny Cow ice cream sandwiches come in a variety of flavors and colors including vanilla, chocolate, vanilla/chocolate mint and peanut butter so there could be a lot of fun variations to match your wedding colors! 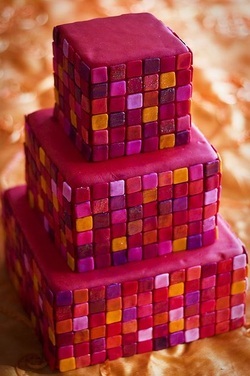 This vibrant mosaic tile wedding cake was created by Elizabeth's Cakes of Milwaukee, WI. I love the vivid magenta, purple and orange shades. And if you look closely, you'll notice that some of the tiles are shimmery. I am obsessed with the color teal...Could you imagine how beautiful this cake would be with a teal/ocean theme?? This cake and other ridiculously gorgeous cakes can be viewed at Elizabeth's Cakes flickr page. Unfortunately, Elizabeth's Cakes website says that they are not taking orders at this time.